Last week’s earthquake is a tragic reminder of the perils of outdated practices and failures of governance. Nepal is one of the world’s least developed countries, with a per capita GDP of $694 that lags even Mali and Burkina Faso. At 40 percent unemployment, the country is heavily reliant on citizens working overseas, whose remittances constitute nearly a third of economic activity. In 2008, the dysfunctional 240-year monarchy was finally abolished, after a violent decade of Maoist insurgence. This political turmoil weakened the effectiveness of Nepal’s national and local governments, including institutions responsible for earthquake preparedness and related issues like infrastructure and urban planning. Following last Saturday’s devastating earthquake, these institutions must now be the focus of reform in mitigating the impacts of future disasters. In a 2014 interview, French geologist Paul Tapponnier said “the place I’m worried about now is central Nepal.” Nepal’s median age is a youthful 22.9, and more than half the population is younger than 24. A majority of Nepalese were not alive for the 1988 earthquake, which before last week had been the country’s most recent major disaster. 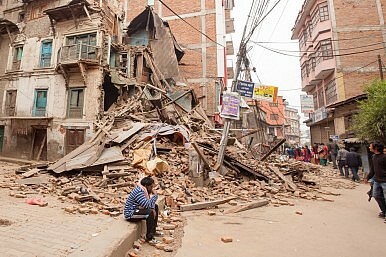 Nepalese residents with earthquake experience are vastly more concerned about damage than those without, according to a recent study. Presumably, this difference applies to perceived needs for preparedness as well. Good infrastructure enables disaster resilience, but informed perceptions and behaviors at both the individual and government levels are also critically important. This earthquake is a tragic reminder of the need to concurrently ensure good infrastructure, policy foresight, and functional institutions for disaster preparedness. In Kathmandu’s case, unstable geological conditions, together with high density and substandard building stock, create a dangerous environment. According to Demographia, Kathmandu is the world’s 33rd densest city out of over 1,000 studied, unsurpassed by any Western city. Compounding this challenge, structural code enforcement and urban planning are weak. In a 2012 interview, a senior divisional engineer at Nepal’s Department of Urban Development and Building Construction noted that construction often proceeds without zoning approval, and that urban plans are rarely implemented. Shockingly, 95 percent of Nepal’s own government offices violate national construction codes. While such buildings may not be the most vulnerable, their lack of compliance suggests a broader culture of negligence in adhering to construction regulations. Given poor building conditions and high urban density, Nepal’s future earthquakes are likely to cause significant property losses and loss of life. In some ways, Nepal was lucky. If this tragedy had occurred at night when more people were inside their homes, death tolls would have been much higher. Also, it happened on a Saturday, when children were not in school. Indeed, schools are often ill-suited to withstand earthquakes, due to physical configuration (large classroom windows, for instance), budgetary constraints and corruption leading to shoddy construction, and scant awareness of the risks leading to inadequate preparation. Given these circumstances, the timing of the earthquake spared the country significant additional injuries and loss of life. In Nepal, municipalities are responsible for land-use planning, construction permits, and the enforcement of compliance with national building codes. These codes have been applicable for at least two decades, but urgently need updating to incorporate new knowledge about earthquake-resistant design and materials. Unfortunately, this 20-year old building code has been incorporated in the permitting processes of only three municipalities out of 58 nationwide. Even in these three, monitoring of code compliance is lax. For all practical purposes, the code is irrelevant and buildings are constructed in any way convenient to developers. Thus, the vast majority of buildings have sub-standard quality, and are prone to collapse during moderate to severe earthquakes. The death toll from the recent earthquake has already exceeded 6200. Preliminary estimates by the United States Geological Survey indicate the physical and economic damage may exceed Nepal’s $20 billion annual GDP. With the current lack of information, it is also unknown whether the hydropower dams near the earthquake’s epicenter have been affected. Nepal already suffers from an electricity crisis, and the problem may now worsen. The earthquake will likely delay the construction of a proposed $1.6 billion hydroelectric dam funded by the Chinese. There may even be reconsideration about the viability of such a large dam in a seismically active region. The anti-dam lobby, which vehemently opposes the development of any such structure, will very likely raise questions and perhaps even legal challenges. This will also delay the construction of other dams in Nepal, which in turn will constrain the availability of electricity necessary for socioeconomic development. Also, the cost of such projects may increase given new seismic concerns. Fortunately, knowledge and technology have advanced significantly in recent years, enabling the construction of large infrastructure in seismic zones. In the long-term, such projects are likely to be economically net-positive. Currently, however, this is a tough political sell. Aside from basic infrastructure and service provision, Nepal’s modest economy hangs in the balance. Tourism, which accounts for about 8 percent of the economy and 7 percent of the workforce, is likely to suffer significantly over the next several months, worsening socioeconomic hardships for the sector’s million-plus employees and their families. In the medium term, the earthquake will dampen Nepal’s economic development and social progress. Further, with Nepal’s accelerated urbanization and clustered commercial activities, the economic and human costs of disasters will increase exponentially in the longer-term. Thus, it is essential that Nepal, and countries like it, boost preparedness. Nepal’s lack of preparedness is no mystery, as the data clearly show. Indeed, population and economic growth continue to occur in the high-risk disaster zones of many developing and overcrowded countries. For infrastructure quality, a crucial determinant of disaster resilience, Nepal ranks 55 out of 132 in the Notre Dame Global Adaptation Index’s measure of disaster vulnerability, and 122 out of 160 in the infrastructure sub-indicator of the World Bank’s Logistics Performance Index. Predictably, the developing world fares poorly on these metrics. It is evident that trends in urban growth, disaster risk, and infrastructure quality paint a dire picture for countries like Nepal. In addition to resilient infrastructure, good response systems are a critical element of preparedness. These systems must have capacity at both national and local levels to respond immediately in the event of a disaster, anticipated or otherwise. Countries like China, India, Indonesia, and Turkey are finding preparedness and response difficult due to numerous challenges, including limited transportation access to mountainous regions where earthquakes often occur. Local governments and institutions are simply unable to cope with rare but extreme disasters. Nepal and other developing countries can learn the lessons from the latest tragedy. Ideally, donors and the Nepalese people will insist that the country’s municipalities not only ensure new buildings are constructed to withstand earthquakes, but also address violations with strict penalties (including the highly-publicized demolition of non-compliant structures). Essential public buildings like hospitals, schools, and police stations should be constructed to the higher safety standards now used in other earthquake-prone countries like Japan and New Zealand. To achieve this vision, both the government and donors should demand a mix of hard options, like earthquake-resistant buildings, and soft options, such as enhanced indigenous capacity for disaster management and improved institutional functionality. Based on the post-disaster experiences of other developing countries, there is little reason to be optimistic that Nepal will turn over a new leaf. Some improvements are likely, but not all those that are needed. This earthquake will remain in the global conscience only until it disappears from the broader news agenda. Sooner rather than later, donor efforts will turn to the next disaster. Once interest fades, Nepal will return to the grim realities of everyday life, facing unsafe and underinvested infrastructure, political stalemate, inefficient and dysfunctional institutions, corruption, and ineffective policy. Ideally, this time would be different. The country should use the crisis to jettison outdated practices and substantively address governance failures. Nepal has an opportunity to kick-start economic growth through the development of high-quality infrastructure, capacity building, and improved disaster preparedness. Is this finally the time to expect fundamental change? Many will be watching. The Himalayan nation joins a growing list of countries losing Temporary Protective Status.